← Editing can be … fun? It’s no secret that I, along with countless others, love Lucy. I own every episode on DVD, have a stack of books dedicated to the show, the actors, and the incredible innovation of everybody involved in Desilu, and even wrote about the timelessly classic cultural phenomenon for a final paper in one of my college courses. Two Lucy dolls sit atop my hutch, a pocketbook with scenes from the show makes me smile whenever I use it, and I’m determined to visit the Lucy-Desi Center in Jamestown, NY sometime soon. 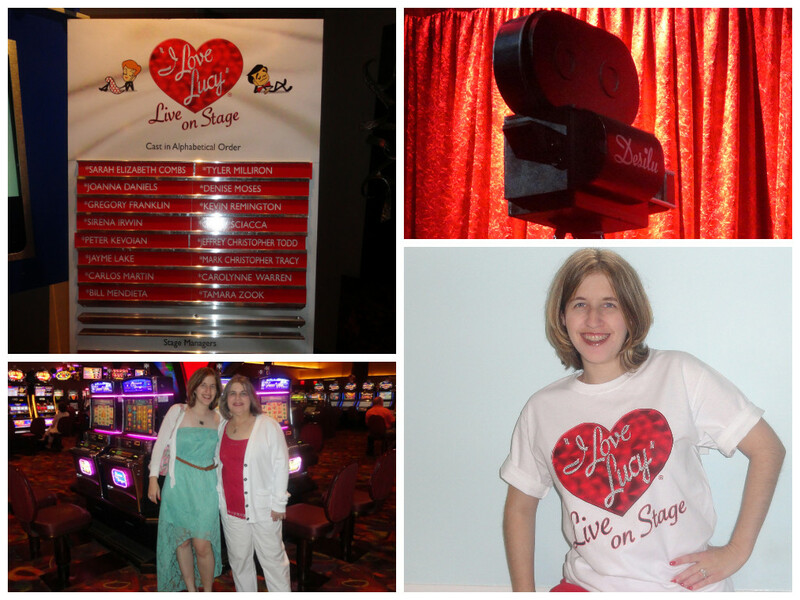 So when I first heard there was an I Love Lucy stage show? And when I subsequently heard that the first stop on the production’s national tour would be Atlantic City? You can bet I was excited. I’d looked forward to seeing the show for months, and it didn’t disappoint. Of course there will forever be something special, something iconic, something untouchable about the dynamic between Lucy, Desi, Vivian, and William. There’s a reason the television show is still aired worldwide, introducing new generations to the hilarious antics of the lovable foursome. But the stage version isn’t about comparisons. It’s about paying homage to the magic and history created more than sixty years ago. From the in-costume actors mingling with people outside the theater, to the setup of the stage and production – designed to mimic the Desilu studios from the 1950s and make the audience feel as though they’re watching two episodes be filmed – to the fabulous talent of the leads Sirena Irwin (Lucy) and Bill Mendieta (Ricky) … well, let’s just say it’s like living in Lucy’s world. I loved every minute, from the episodes themselves (“The Benefit” and “Lucy Gets Her Eyes Examined”) to the interludes with live, in-person commercials, just like the audience experienced it six decades ago. The cast had grandiose shoes to fill, but they did it beautifully. Sirena’s facial expressions and comedic timing were so on point with Lucille’s, and I swear, if you closed your eyes while listening to Bill talk, it’s like you were hearing Desi … that’s how perfectly he did his accent. They are fantastic. I’m keeping my fingers crossed that, after this leg of the national tour, they’ll decide to travel the country again and perform new episodes. I will happily be front and center for it. So much of society today is about looking forward, dreaming and planning and working toward the future, and while that’s important, of course, I think it’s equally as necessary to take a step back sometimes. Getting to do that yesterday was a treat. It was such a neat experience, and I’m sending all my appreciation to everyone involved in the production for giving that joy to countless audience members across the country. The original show made its viewers smile from start to finish, from the opening chords of the famous theme song to the last ones. This show does the same (even down to that theme song, which they performed at the end!). I didn’t think it was possible, but truly, it made me love Lucy even more. Oh, I love stage shows! They can be so funny and beautiful, especially if they’re done right. I don’t think I’ve ever heard of this show, but it looks cute :) Fingers crossed for you that they come back with more episodes later. It was so, so neat — seriously like stepping back into the 1950s and being right there with Lucy, Ricky, Ethel, and Fred. Such a cool concept for a stage show! so fun to hear all your excitement :) sounds like a really good show. That sounds great. Somehow, I got the idea of The Carol Burnett show in my head when I was reading this. I wish I had those episodes on DVD. There’s just something special about those classic, timeless series, isn’t there? I hope you can find The Carol Burnett show on DVD, too! That sounds like so much fun! I’m glad you had such a great time.